Lottie brought in her crystal collection to show the class. Can you guess which one is bismuth, rose quartz, opal item and moissanite? Shoo Rayner taught us how to draw amazing seagulls! Mrs Milton showed us the video that her very clever son made for the Titchmarsh School leavers. He is going to make one for our leavers this year to the Pharrell Williams song ‘happy’. We need to learn the words and think about moves we can do for the video. If we are out and about visiting interesting places we can ask our parents to video us dancing and miming and it can be added to our school video. Chris from Pacesetters taught us all about push passes, slap passes, hits and stopping the ball in our first hockey session. Have a look at our action shots! Some of us found it hard to do the sponsored silence but Miss Ibotson was amazed that we kept silent for 20 minutes! We are still learning to knit. One of our year 4’s is exceptionally neat already! We talked about toys and games in the 1940’s and had a game of ‘pick up sticks’…..trickier than we thought. Life during WW2 must have been very different from today with no mobile phones, D.S.s, i-pads or televisions! Homework this week is a food diary. Please record at least 3 days. The day we kept quiet! We started off our new half term with a mega- maths morning where we got to grips with all the fantastic calculation and times tables apps on our i-pad minis and we also looked at various calculation strategies and which ones suited which questions, recapping on partitioning and more formal column methods. We investigated the properties of different thermal conductors with three hot water bottles made of different materials. How did we try and make our testing fair? We had a go at the Shoo Rayner drawing tutorial on YouTube and saw an amazing slide show from the Yorkshire Air Museum, well worth a visit for all the amazing hands on aircraft and a fab gift shop! We met our new dance teacher, Megan who showed us some really cool moves. Next week we might even get our teachers to have a go so we can all strut our stuff at the next Titchmarsh disco. (Thank you for inviting us Titchmarsh; we had a fantastic evening and great D.J.ing Miss Aldous! )! Spywatch was very exciting today! 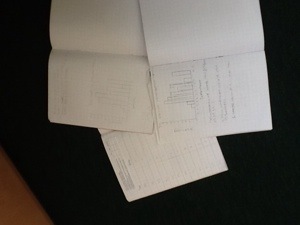 We made frequency tables and bar charts from our temperature readings this term in maths. Miss Ibotson was really impressed with our progress in this and we all did it independently. Rohan and Joel took their cello medal grading with Miss Paterson. 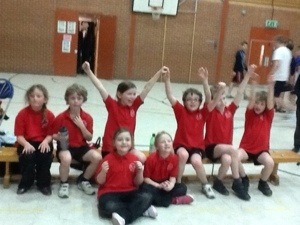 The main talk of the day was how amazing the Basketball team were in last nights tournament at Prince William School. Team Badgers made it into the final and were narrowly beaten by Nassington. Miss Aldous, Mrs Milton and Mrs Wiggins have already sent their congratulations. Check out the Warmington School Sports blog for a report by Storm and some great action shots! In our story Friend or Foe by Michael Morpurgo David and Tucky find the German Airmen who have crashed their plane on the moor. One of the airmen has saved David from drowning and the other is very ill. They need food and warmth to survive. The boys dilemma is should they help the airmen or tell the authorities where they are. Some of us pretended to be David and Tucky and videos our thoughts on the I- pad minis. some of us had a discussion and wrote down our thoughts. We then watched the videos on Apple T.V. and had a heated debate! Have a look at some of our wonderful timetable homework we did last week. We all presented our work in different ways. One of us achieved a merit and 3 house points! Our last basketball practice with Rob before the big tournament tonight! Look at the amazing time we have at Breakfast Club. This morning some of us made models, some of us drew pictures, read or did maths puzzles. We have loads of activities to choose from while Mrs Bretherick looks after us and makes us breakfast. Well done to this year 3 who tries really hard in every lesson!